4K technology spreading into all entertainment areas like Photos, Videos, Photography trends. All 4K cameras like DSLR’s, video production cameras and Leica 4K cameras can shoot both photos and videos. Two types of Cameras available in the market today. Video Production Cameras and the Hybrid Cameras. now its time to know about Leica Cameras With 4K Video Shooting & Production. 4K technology is the Capacity of shooting an incredibly detailed photo or a video which is adaptable to 4k Technology TVs and 4K projectors. The resolution of 4K videos starts from a minimum of 3, 840 x 2160 pixels to a maximum of 4096 x 2160 pixels. Here we have listed the best Leica Cameras with 4K Video shooting and cost-effective Cameras. This camera shoot around large region of 12.8 MP 4/3’’ inch MOS sensor greater depth of field control. It provides bright and high resolution output. It will control the shade with this sensor. Fast f/1.7 – 2.8 Leica DC Vario Summilux lens provides an excellent light gathering when it is fully zoomed. Low light is not an obstacle to this camera because it has an ISO range of 100 to 25600 and bright focal length. It can record UHD 4k video (3840 x 2160) of 30p and MP4 video of 1080p/60 resolution standards. The fixed lens perfectly matches to the sensor with perfect picture quality. It has high resolution options, wireless connectivity, Multiple exposure methods and durability. It has a higher ISO sensitivity of 6400 , HD and full HD videos are captured with this Camera. Longest shutter speed is 125 seconds and it’s compatible with Leica CS lenses. The Image sensor is from 45 x 30 CMOS sensor and 37.5MP effective pixels. The maximum resolution of Leica S (007) is 7500 x 5000 , 16 bit color depth. It has different driving modes like self,interval, continuous and self timer. Shutter speed of 125 to 1/4000 seconds and a continuous shooting rate up to 3.5 fps. It has the maximum file size up to 42MB this is lossless compressed DNG and 16-1 MB depending on the image resolutions. Full HD video recording with 1920 x 1080 resolution and 4K video recording with 4096 x 2160 high resolution. 100% LED coverage and inbuilt WIFI and GPS system. The Camera weight is under 2.8 lb/1.26 kg without battery. 6.3 x 3.1 x 4.7″ / 160 x 80 x 120mm camera Dimensions. SCA 3502, TTL, TTL HSS, Auto, Manual flash control with LEMO flash-sync flash Interface. Leica S-E (006) has 45 x 30mm CCD image sensor, 37.5 MP effective pixels. The maximum resolution of Leica S-E (006) Camera are 7500 x 5000 resolution with 3.2 aspect ratio. Multi-pattern EV 1.1-20 and Center-weighted, Spot: EV 2.1-20. This camera also has shutter speed 125 to 1/4000 seconds and a continuous shooting rate up to 1.5 frames per second. It has single, continuous and self timer driving modes. The maximum file size is 72 MB in DNG and DNG lossless compressed is 42MB. There is no limit for JPEG and 2GB buffer size that is up to 28 images. 100% LED coverage and inbuilt WIFI , GPS sensor system. Leica SL is a high end Mirrorless Camera with 4K videos with impressive stills and video space. It has 24 megapixel full frame CMOS sensor,. Built in WIFI and GPS system. Leica SL can shoot 4K videos with high resolution DCI of 4096 x 2160 at 24 fps and 3840 x 2160 UHD video at 25 to 30 frames per second. It can shoot 120 fps in full frame mode. It has Leica Maestro II image processor. It is weather resistant with full aluminium body. It can save 4k videos and at a time 8MP photo. It is a touch screen and time lapse driving modes. Leica X-E Digital Compact camera equipped with 16.1 megapixel has a large CMOS sensor in APS format. Leica X-E (Typ 102 ) Digital camera with Elmarit 24 mm f/2.8 ASPH is an interchangeable lens with superior quality of optical performance. This camera has classic size and Compact format. It is fully metallic body and leather finish grip gives you easy handling. It has 2.7’’ bright display even in bright surroundings and finest quality of picture. Live mode makes x2 particularly versatile, unusual shots taken also it can handle. Leica X2 has retractable flash, which acts as a main flash and fill in flash synchronized with the second screen shutter. The ISO sensitivity is 12500 and if it takes to continuous shooting max at 5fps. It is an almost lightweight camera and 100% LED Coverage and built in WIFI and GPS. If you are searching for Leica 4K cameras for shooting 4K videos go and check this article as best guide. But you should spend more money on this Leica Cameras because Leica Cameras are cost effective. 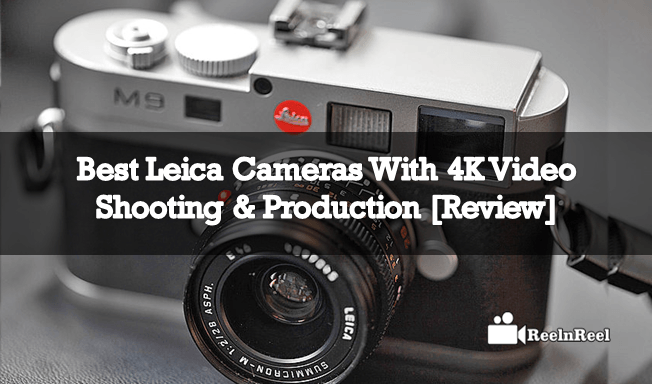 Here we have listed the best Leica Cameras with 4K video shooting and production.